Open cinnamon rolls and gently unroll in a sheet (do not separate), exposing the cinnamon center of the rolls. In a small bowl, stir together the cake mix and butter until a paste forms. Spread this over the cinnamon rolls. Gently re-roll the cinnamon rolls, separate into single rolls, and place in a 9 inch cake pan which has been lightly coated with nonstick baking spray. Bake for 12-18 minutes, or just until the cinnamon rolls turn a light golden brown. Remove and cool completely. Tint half of the frosting red with Betty Crocker™ gel food coloring. Add the extract to the white half of the frosting. Spoon the red frosting into one half of a pastry bag (fitted with a large star tip) and gently fill the other half of the bag with the peppermint-flavored white frosting. Pipe frosting over cooled cinnamon rolls. Sprinkle with holiday sprinkles. Serve and enjoy! Take some cinnamon rolls, some cake batter, and some frosting and, well, there you have it. There's something sweet and wonderful about the added bliss of cake batter flavor to just about any recipe. Knowing this, we were like…why not turn a basic package of Pillsbury cinnamon rolls into the most delicious batch of holiday cinnamon rolls ever? 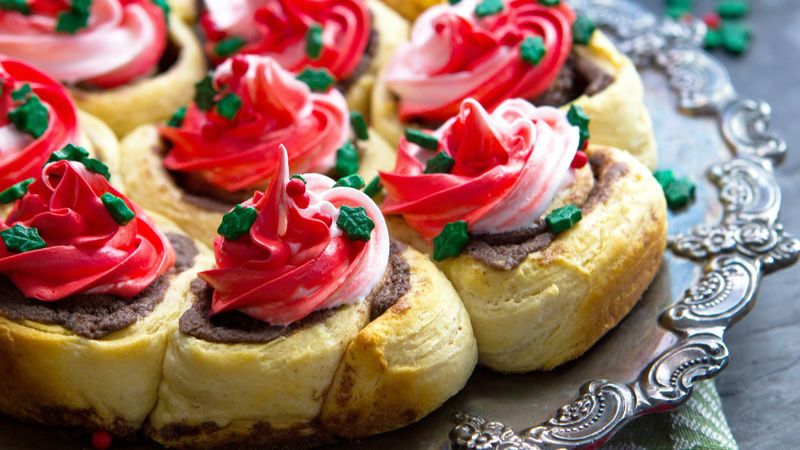 Just a few basic ingredients is all you need to turn prepped Pillsbury Cinnamon rolls into a peppermint and cake batter explosion of delicious. Unroll a tube of Pillsbury Cinnamon Roll dough. Top it with a mixture of melted butter and ooey, gooey Betty Crocker chocolate cake batter. Re-roll the cinnamon rolls and gently pull them apart at the seams. Place the cinnamon rolls in a greased 9" cake pan. Prep a tube of frosting by mixing half a jar of Betty Crocker vanilla frosting with red gel food coloring and a smidgen of peppermint extract. Spoon each color into one half of a pastry bag fit with a large star tip. Allow the rolls to cool completely, and then get to decorating!